Dr. Michael Paulsen received his DVM degree from Texas A & M University in 1977. That same year, Dr. Paulsen was awarded the Thomas S. Gathwright Award for Academic Excellence. After graduation, Dr. Paulsen was commissioned in the U.S Army and served seven years on active duty in the Army Veterinary Corps. From 1984 to 1987, he attended graduate school and completed an ophthalmology residency at the Colorado State University- Veterinary Teaching Hospital. In 1987 Dr. Paulsen received a Master of Science degree in Clinical Sciences and became a Diplomate in the American College of Veterinary Ophthalmologists. 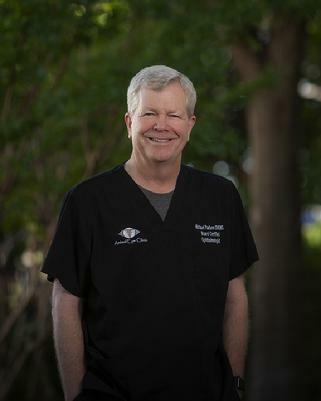 Dr. Paulsen established the Animal Eye Clinic in Fort Worth in 1987 and in 1989 accepted a position in the Eye Clinic for Animals in Garden Grove, California. After one year in California, he reopened his practice in the DFW Metroplex. For over 10 years, Dr. Paulsen practiced ophthalmology in Texas and Hawaii. In 2004, he retired Hawaii Animal Eye Consultants to focus on Animal Eye Clinic in the DFW Metroplex. In 2007, Dr. Paulsen retired as a Colonel from the Army Reserves. Dr. Paulsen is married with two children. He has two Cavalier King Charles Spaniels named Willoughby and Webster; one Shih Tzu mix named Pebbles; and three cats.